Newspaper article highlighting complaints from Sanford parents about the potential safety hazards of an old ice house operated and leased by Thomas Ice Company. Ice manufacturing became a prominent industry in the United States by the beginning of the twentieth century. Most ice houses consisted of two stories with the first floor used as food storage and the second floor used to store the ice. Ice houses provided blocks of ice for home ice boxes and allowed agricultural businesses to transport their fruits and vegetables in refrigerated vehicles. 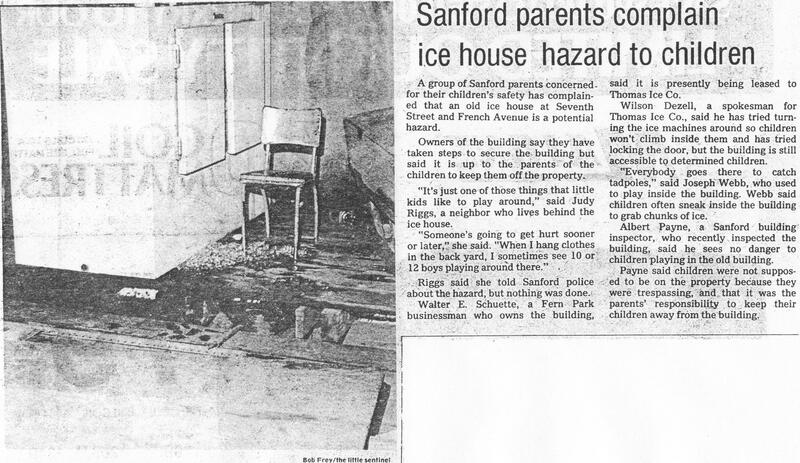 Photocopy of original newspaper article by Bob Frey: "Sanford parents complain ice house hazard to children." The Little Sentinel, August 16, 1978, page 8: Ice Collection, Sanford Museum, Sanford, Florida. 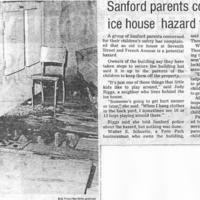 Original newspaper article by Bob Frey: "Sanford parents complain ice house hazard to children." The Little Sentinel, August 16, 1978, page 8. Digital reproduction of photocopied newspaper article by Bob Frey: "Sanford parents complain ice house hazard to children." The Little Sentinel, August 16, 1978, page 8. The Little Sentinel, August 16, 1978. Ice Collection, Sanford Museum, Sanford, Florida. Ice Houses of Sanford Collection, Sanford Collection, Seminole County Collection, RICHES of Central Florida. Originally created by Bob Frey and published by The Little Sentinel. Copyright to this resource is held by The Little Sentinel and is provided here by RICHES of Central Florida for educational purposes only. Hiles, Theron L. The Ice Crop, How to Harvest, Store, Ship and Use Ice: A Complete Practical Treatise for Farmers, Dairymen, Ice Dealers, Produce Shippers, Meat Packers, Cold Storers, and All Interested in Ice Houses, Cold Storage and the Handling or Use of Ice in Any Way. New York: Orange Judd Company, 1893. Wallis-Tayler, Alexander James. Refrigeration, Cold Storage and Ice-making: A Practical Treatise on the Art and Science of Refrigeration. London: Crosby Lockwood and Son, 1902. A group of Sanford parents concerned for their children's safety has complained that an old ice house at Seventh Street and French Avenue is a potential hazard. Owners of the building say they have taken steps to secure the building but said it is up to the parents of the children to keep them off the property. "It's just one of those things that little kids like to play around," said Judy Riggs, a neighbor who lives behind the ice house. "Someone's going to get hurt sooner or later,” she said. "When I hang clothes in the back yard, I sometimes see 10 or 12 boys playing around there." Riggs said she told Sanford police about the hazard, but nothing was done. Walter E. Schuette, a Fern Park businessman who owns the building, said it is presently being leased to Thomas Ice Co. Wilson Dezell, a spokesman for Thomas Ice Co., said he has tried turning the ice machines around so children won't climb inside them and has tried locking the door, but the building is still accessible to determined children. "Everybody goes there to catch tadpoles," said Joseph Webb, who used to play inside the building. Webb said children often sneak inside the building to grab chunks of ice. Albert Payne, a Sanford building inspector, who recently inspected the building, said he sees no danger to children playing in the old building. Payne said children were not supposed to be on the property because they were trespassing, and that it was the parents' responsibility to keep their children away from the building. Frey, Bob. “Sanford Parents Complain Ice House is Hazard to Children.” RICHES of Central Florida accessed April 24, 2019, https://richesmi.cah.ucf.edu/omeka/items/show/616.